The family that comes together, ums together. fills in my blank …………. There’s something about visiting my older relatives over a holiday that gets me fretting about my aging Boomer brain and body, dementia, tip of the tongue syndrome, and similar concepts. (see, e.g., “pity the baby-boomer raconteur,” Nov. 23, 2007). As I confessed when I wrote about Michael Erard’s Um the Book last September, quite a few members of my family use that little pause-filler a lot. At the time I asked the question, at least two of my aunts were in the room. Now, I don’t want to sound too much like one of those self-aggrandizing small-firm lawyer ads, but we had over 200 years of flipper-use-experience in that kitchen among the three of us. Nonetheless, we could not conjure up the name of the item in question. Finally, Bella asked her 11-year-old grandson (who is normally monosyllabic with adults) what you call the food-flipper thing, and (yes, to my amazement) he immediately replied correctly, “a spatula.” Damn. It wasn’t even on the tip of my tongue. Figuring I might as well get something useful out of the incident, I Googled a bit to find information on the “tip of the tongue” phenomenon, and on the word spatula, and then looked around our archives for more-or-less related haiku and senryu. If that sort of pastiche posting interests you, stick around and keep reading. A spatula, also known as a fish slice in British English, is a kitchen utensil with a long handle and a broad flat edge, used for lifting fish and fried foods. 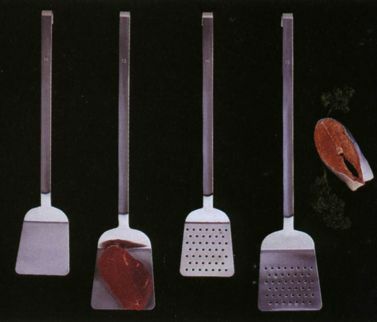 Though the word spatula is used in British English, it refers solely to a mixing and spreading implement. In parts of Canada and the United States, spatulas are sometimes called flippers or turners. They are used both in the preparation of food, as a flipping implement, and in the serving of food. Often the plate scraper is referred to as a spatula. The word spatula, known in English since 1525, is a diminutive form of the Latin term spatha, which means a broad sword (as in spatharius) or a flat piece of wood and is also the origin of the words spade (digging tool) and spathe. The tip of the tongue (TOT) phenomenon is an instance of knowing something that cannot immediately be recalled. TOT is a near-universal experience with memory recollection involving difficulty retrieving a well-known word or familiar name. When experiencing TOT, people feel that the blocked word is on the verge of being recovered. Despite failure in finding the word, people have the feeling that the blocked word is figuratively “on the tip of the tongue.” Inaccessibility and the sense of imminence are two key features of an operational definition of TOTs (A.S. Brown, 1991). The experience of TOT appeared in non-academic literature as early as 1885. . . . In 1966, Harvard psychologists Roger Brown and David McNeill reported the first empirical investigation of the tip-of-the-tongue state. . . . They also found that TOT is a fairly universal phenomenon, TOTs occur about once a week and increase as you age, and they’re often caused by proper names. . . .
TOT research in children has mainly focused on when they begin to experience TOTs and what the experience is like for them (Brown, 1991). . . . TOTs occur more often in third graders (ages 6-7) than they do in kindergarteners and first graders. More research has been done with TOTs in older adults. In terms of subjective estimates, research has found that older adults report experiencing TOTs about as often as younger adults (Brown, 1991). However, . . . young adults were found to experience significantly fewer TOTs than older adults. Other TOT literature has found that older adults remember less information about the target word and bring up fewer related words during the TOT experience and are less active in resolving the TOT experience (Brown, 1991). is raised . . .
Keeping your experience of language diverse (e.g., playing scrabble, doing crosswords) may help reduce TOTs. she says she’ll have . . .